Online education platform WizIQ, owned and operated by Mohali-based authorGEN Technologies Pvt Ltd, has introduced a learning marketplace on its platform, where teachers and educational organisations can publish massive open online courses (MOOCs) or paid courses for free, and offers their expertise to WizIQ's existing users. 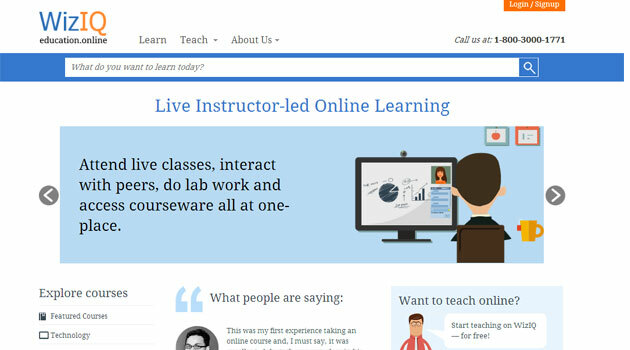 The learning marketplace offers live instructor-led online learning, which enables students to choose from courses offered by thousands of instructors. The firm claims that educators and organisations can create quality online courses with live or self-paced instruction, in a short time. The courses on WizIQ are all created and owned by instructors, providing complete freedom to educators and organisations to manage and charge for their content and teaching services. Educators, who prefer not to have their courses featured in the public marketplace, can use the platform to host private instruction for students. A freemium plan has been introduced for individual educators for up to 10 attendees. With this plan, teachers can create and deliver unlimited number of private courses and conduct unlimited number of live classroom sessions for free. An advanced features package is also available with a subscription fee. Teachers can keep 90 per cent of every transaction, while WizIQ will get the rest as a service fee. The marketplace features courses in popular and in-demand categories such as technology, Big Data, project management, business, finance, languages, lifestyle & wellness and music. WizIQ was founded in 2007 by Harman Singh, who had also earlier founded another startup called authorSTREAM, an online PowerPoint-sharing platform. WizIQ connects educators and learners through its virtual classroom technology. The platform offers a course delivery system for teachers, trainers, colleges & universities, high schools, and training & tutoring centres around the world. The firm claims to have a user base of over 3.5 million. Apart from Hyderabad, the company also has offices in Mohali and North Carolina in the US. In January last year, the company had raised $4.1 million from education-focused private equity firm Kaizen and German media major Bertelsmann. Early this year, online marketplace Snapdeal.com launched an education marketplace on its portal, which also enables consumers to access a wide range of test preparation material, certificate courses, classroom training and online courses. The company has already partnered with e-learning companies including Edukart, Simplilearn, Meritnation, EasySkillz, Practice Guru and Test Funda, to provide the service.